It was 1981, Scott was a typical high school jock. He loved watching and playing sports, especially football. One team, stood out to him, BYU. Their teamwork and passing skills impressed him. Jim McMahon was the quarterback. They were scoring, sometimes, 60 points in one game! The team peaked his interest. He scribbled down “Brigham Young University” on a scrap of paper and took it with him to school on Monday. He went to the school library and found out that BYU was affiliated with the Church of Jesus Christ of Latter-day Saints. He did some research (as much research as he could without “Google” and “Wikipedia”). He borrowed a Book of Mormon from the library, conducted his junior year research paper on the Mormon church, and met with the missionaries. Scott believed in God, regularly attended another church, and actively participated in the youth group program there. He was, however, quite fascinated with the Mormon church. He asked his youth group leaders if a few of the youth could tag along with him to the Mormon church on Sunday. He soon found out that the stake center was only a mile from his home. They complied. He had a wonderful experience. Due to his family situation and the great distance between Ohio and Utah, Scott did not have the opportunity to attend Brigham Young University. He was, however, the first person in his family to ever attend college. A few years after college graduation, he and his high school sweetheart joined the Church of Jesus Christ of Latter-day Saints and left a legacy of learning and of the gospel of Jesus Christ to me, their daughter. I will be forever grateful for my parents, who have taught me the importance of getting an education and of living the gospel of Jesus Christ faithfully. I hope to pass on that legacy of love to my own posterity. In what ways will you leave a lasting legacy? It’s tradition at the BYU Jerusalem Center to sign one’s name on the pipes in the crawlspace under the lower auditorium. My signature has been there for three years now, but the mark I left on the Holy Land was more than my initials on a piece of subterranean plumbing. Everyone at BYU has heard of Karl G. Maeser, the pioneering German educator with a strict moral compass, famous for his chalk circle of honor quote prominently featured at the testing center. Less well known is the fact that President Smoot recommended Maeser as the new principal for Brigham Young Academy. Smoot first saved the academy fiscally, before rescuing it academically through his wise leadership. Boosting the academy over its initial hurdles galvanized President Smoot’s commitment to it. His interest in the school was later sanctioned, or rather mandated, by the prophet. In a final admonition to President Smoot, Brigham Young said, “I desire you, Brother Smoot to turn your influence and your energies to the building up of that academy.” A.O. wholeheartedly gave everything to fulfill this charge. In the decades since, many others have given much to sustain the university and its students. 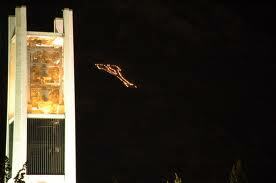 As I ponder the impact BYU has on the world, the iconic image of the Y lit up on the mountain is literally a light on a hill. The light of learning at BYU has influenced millions with the education and experiences to make their own marks on the world. Because Abraham Smoot, Brigham Young, Karl Maeser, and others like them caught the vision of building up an academy for the Saints, I’ve been able to study my craft in the light of the gospel. I’ve been able to learn holistically, meaning “by study and also by faith.” As I’ve entered and learned, I’ve been well prepared to go forth to serve. Such is BYU’s motto and a foundational premise deeply cherished by its earliest founders. I served as a Primary teacher in the Jerusalem branch that summer I spent in the Holy Land. Those valiant seven-year-olds definitely taught me more than I taught them, and I trust that my love for the Savior and His Church made an impression in their young hearts. While my initials on the pipe will fade, the mark of a committed Primary teacher will guide them to walk in the light and seek the blessings of eternity. Beyond the funds consecrated 165 years ago, far beyond the administration building that bears his name; the mark President Smoot made extends into the lives of all who have crossed paths with BYU. In my studies and experiences at BYU, both before and after my mission, I’ve discovered a passion for teaching and learning that will provide direction for the rest of my life—I’ve decided to make my mark as a teacher. I will influence the lives of hundreds of students who will in turn impact thousands of other lives. I too love that school. And it does live.